TMMi is a not-for-profit independent test maturity model developed by the TMMi Foundation. TMMi is being applied in various domains and industries world-wide and is rapidly gaining recognition. By many test professionals it is already perceived as the de-facto standard for test improvement and assessment. Using TMMi, organizations can improve their test process and even have their test process or test organization accredited when it complies with the requirements. The most important differences between TMMi and other test improvement models are independence, compliance with international testing standards, the business-driven (objective-driven) orientation and the complementary relationship with the CMMI framework. 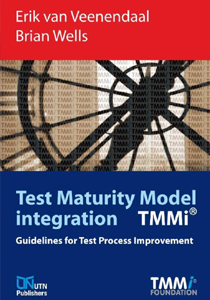 Test Maturity Model integration (TMMi) – Guidelines for Test Process Improvement is the definitive reference for the release 1.0 of the TMMi. It provides a single source for all TMMi model information. The target audience for this book includes anyone interested in test process improvement – whether one is familiar with the concept or whether one is seeking information to get started on test improvement. It is intended for those who want an assessment to see where they are, those who already know what they want to improve, and those who are just getting started and want to develop a general understanding of TMMi.